237 Beacon is located on the south side of Beacon, between Clarendon and Dartmouth, with 235 Beacon to the east and 239 Beacon to the west. 237 Beacon was built ca. 1870 as the home of Nathaniel Silsbee, Jr. He purchased the land for 237 Beacon from the Commonwealth of Massachusetts on April 1, 1871, after the house had been built (it is shown as his residence in the 1870 City Directory), probably built under an earlier purchase and sale agreement with the Commonwealth. 235 Beacon was similarly built before the land was conveyed by the Commonwealth, also on April 1, 1871. It was owned and built by Robert T. Bourn (Bourne) and William Leavitt, carpenters, who may also have built 237 Beacon for Nathaniel Silsbee. Click here for an index to the deeds for 237 Beacon. Nathaniel Silsbee, Jr., and his wife, Marianne (Devereux) Silsbee lived at 237 Beacon from about 1870. Their unmarried son, William Edward Silsbee, lived with them. They previously had lived at 183 Beacon. They also maintained a home in Milton. In about 1868, their son-in-law and daughter, Frederick and Mary (Silsbee) Whitwell, had built their home next door, at 239 Beacon. Nathaniel Silsbee was a former shipping merchant in Salem. He had served as a Member of Congress from Salem in 1833 and 1846. In 1862, he was named treasurer of Harvard and moved to Boston. 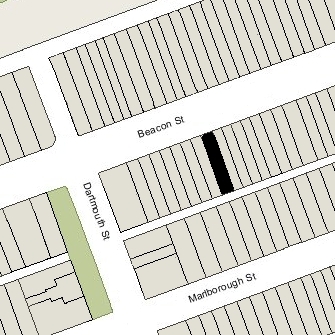 In mid-1880, Frederick and Mary (Silsbee) Whitwell lived with the Silsbees at 237 Beacon while the Whitwells’ new home at 230 Marlborough was under construction (the permit application for which was dated February 27, 1880). Nathaniel Silsbee died in July of 1881. Marianne Silsbee and their son, William, moved soon thereafter to 240 Marlborough. 237 Beacon was not listed in the 1882 Blue Book. On November 11, 1881, 237 Beacon was acquired from Nathaniel Silsbee’s estate by Francis Amasa Walker. He and his wife, Exene Eveline (Stoughton) Walker, made it their home. In 1880, they had lived in New Haven. Francis Walker was president of MIT. He served from 1861 to 1865 in the Union Army, retiring with the brevetted rank of Brigadier General. He was a noted economist and statistician. He served as Superintendent of the 1870 US Census, after which he was a professor of political economy at the Sheffield Scientific School at Yale and a lecturer at Harvard. He once again served as Superintendent of the US Census in 1880, after which he was appointed president of MIT. Francis Walker died in January of 1897. Exene Walker continued to live there during the 1897-1898 winter season, but moved soon thereafter. In 1898, 237 Beacon was the home of attorney John Lowell, Jr., and his wife, Mary Emlen (Hale) Lowell. They also maintained a home in Chestnut Hill, which previously had been their primary residence. By the 1898-1899 winter season, they had moved to 125 Beacon. 237 Beacon was not listed in the 1899 Blue Book. During the 1899-1900 winter season, it was the home of Richard Hathaway Morgan, a retired manufacturer from New Bedford, and his wife, Joanna White (Davis) Morgan. They also maintained a residence in Plymouth. They had moved to 228 Beacon by the 1901-1902 winter season. 237 Beacon was not listed in the 1901 Blue Book. On April 30, 1901, 237 Beacon was acquired by the MIT Chapter of the Phi Beta Epsilon, fraternity. It previously had been located at 531 Massachusetts Avenue. It continued to occupy 237 Beacon until about 1917, when it moved to 400 Charles River Road (Memorial Drive) in Cambridge. 237 Beacon was not listed in the 1917-1920 Blue Books. On August 19, 1918, 237 Beacon was acquired from the Phi Beta Epsilon Corporation by John D. Hardy of Wellesley. On October 6, 1919, it was acquired by John D. MacLeod of Newton. During the 1920-1921 winter season, 237 Beacon was the home of Arthur Lawrence Derby, a consulting engineer, and his wife, Jeanette (Barr) Derby. They previously had lived in an apartment at 138 Marlborough. By the 1921-1922 season, they had moved to 8 West Hill Place. On June 2, 1921, 237 Beacon was acquired from John D. MacLeod by Samuel Goldsmith of Newburyport. On January 28, 1922, 237 Beacon was acquired from Samuel Goldsmith by Miss Emma G. Marcotte. Her mother, Emilie (Dubuque) Marcotte, the widow of Leon Marcotte, lived with her. They previously had lived at 289 Newbury. 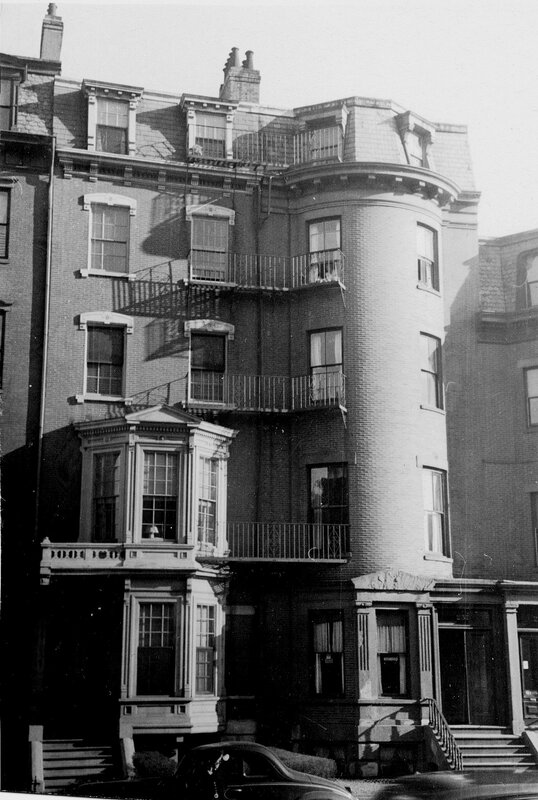 Miss Marcotte operated a lodging house at 237 Beacon and in June of 1928, she was cited for failing to provide adequate egress. In July of 1929, she applied for (and subsequently received) permission to remodel the interior to comply with the egress requirements. Emilie Marcotte died in July of 1947 and Emma Marcotte moved soon thereafter. On May 7, 1948, 237 Beacon was acquired from Emma Marcotte by real estate dealer Stuart Kates (Katze). He continued to operate it as a lodging house. He and his wife, Lenore F. (Sloan) Kates, lived in Lowell. On September 12, 1969, 237 Beacon was acquired from Stuart Kates by attorney and real estate dealer Peter N. Kinder. It continued to be a lodging house. On January 2, 1973, 237 Beacon was acquired from Peter Kinder by Shane A. Cunningham. 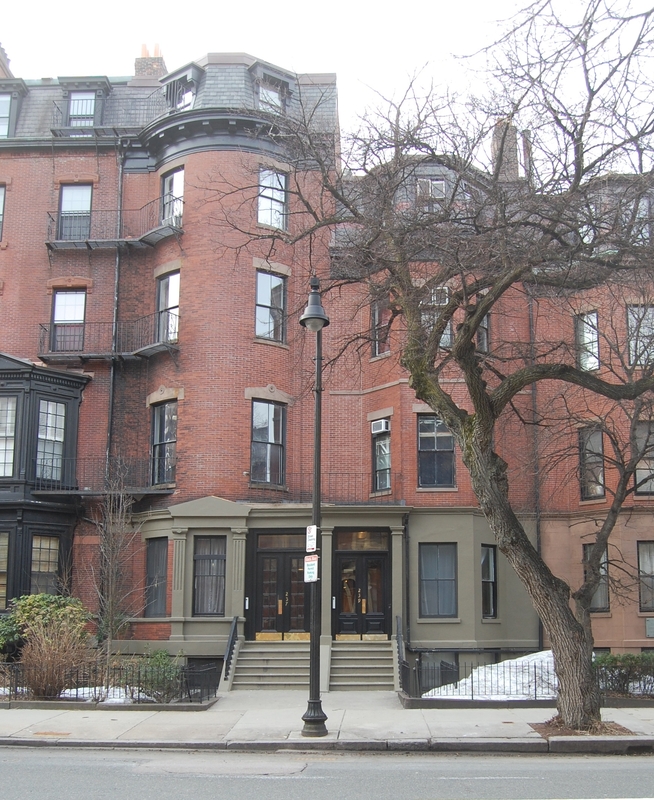 On July 20, 1978, he transferred the property to Sara L. Costello, trustee of the 237 Beacon Street Trust. In May of 1985, Shane Cunningham acquired 239 Beacon. His Sun Management Company operated both 237 Beacon and 239 Beacon as lodging houses. 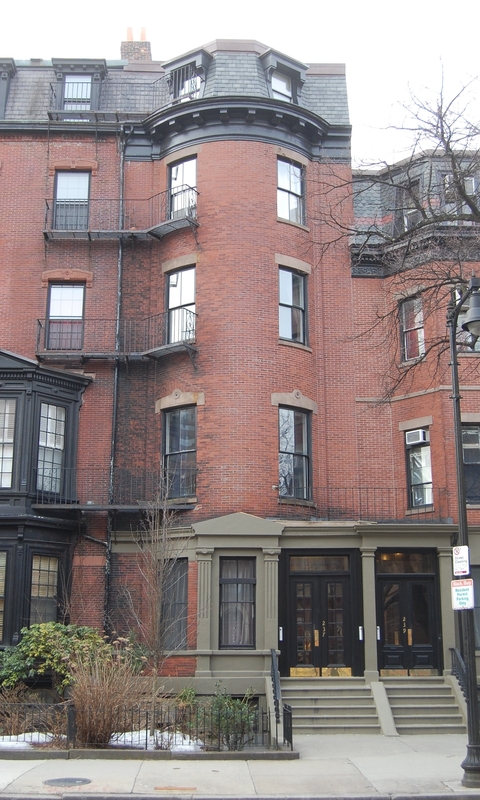 On June 10, 1991, Shane Cunningham succeeded Sara Costello as trustee of the 237 Beacon Street Trust, and on March 20, 2000, he transferred the property to the 237 Beacon Street Corporation, of which he was president and treasurer. 237 Beacon remained a lodging house in 2016.